This will be the first negative review I have written. I almost don’t want to post it but for what purpose? Even the Twitter page says, “Trying everything once and telling you all about it. Good or bad!”. I would only be doing you a disservice by not telling you about my disappointing experience. First of all, with a name like Retro Diner I had a certain expectation about what I would get. The logo certainly gives the impression of an American diner. It was also very small inside and so we were sat in same area people queue for take away food. The decoration didn’t feel as though it was something I should find in a diner either. The chairs were regular wooden chairs and the tables were covered in a tired looking table cloth patterned with American cars. Again giving the impression, I was supposed to be in an American diner. It had an Artex textured ceiling. You might be surprised to hear that it turned out to be a carvery of some sort. 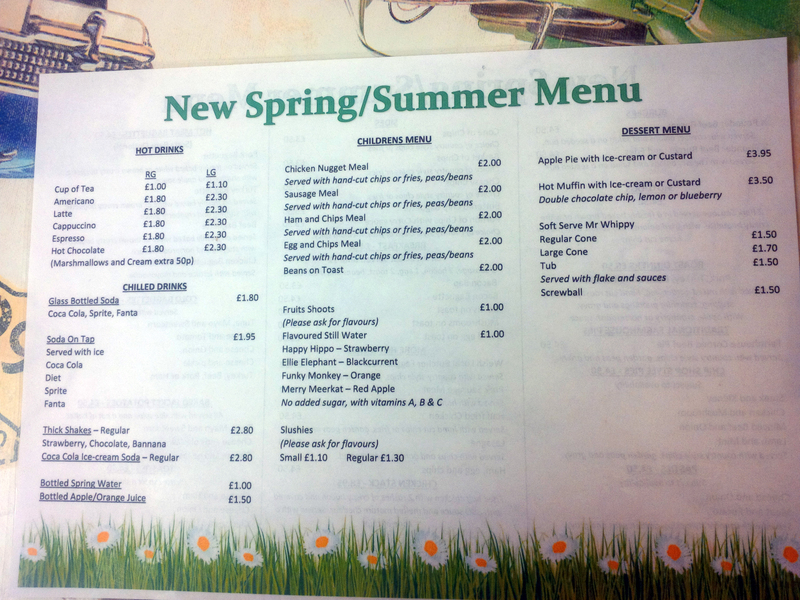 Fairly standard British cafe menu really. Still, I was hungry. So was my daughter and so we ordered anyway. The orders were taken at our table. 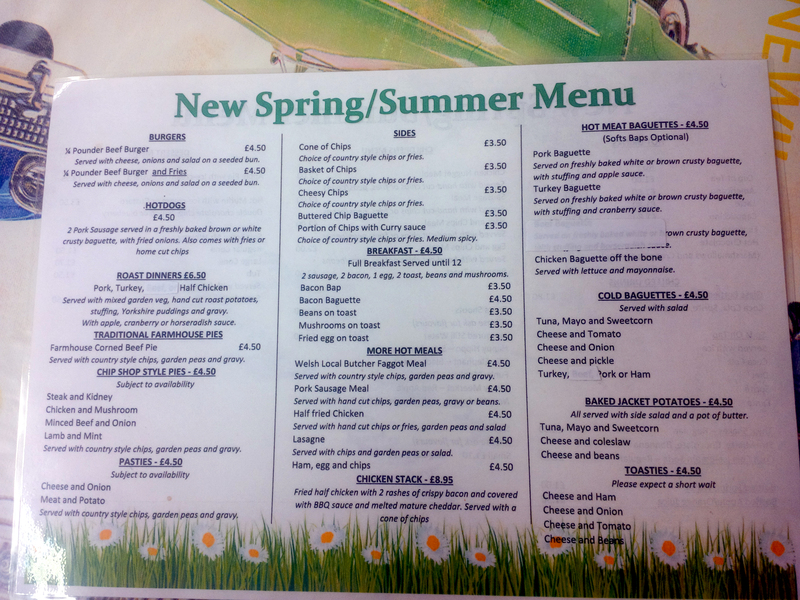 I ordered the Pork Baguette and my daughter had the children’s sausage and chips with peas. It actually took me a minute to convince the waitress that I didn’t want a roast dinner and that they do in fact offer Pork Baguettes. Eventually, she did realise her mistake and my order was placed. Some twenty to thirty minutes later our orders arrived. Considering what we ordered and the fact the place was near enough empty when we arrived, it took longer than I had expected. 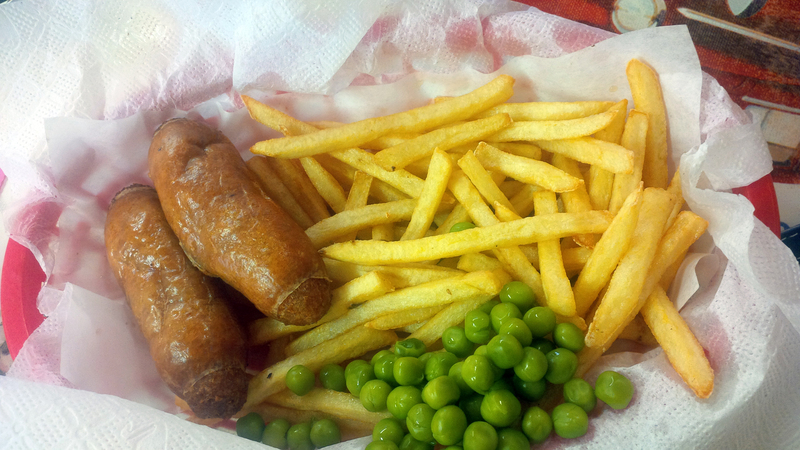 The children’s sausage and chips look about the same as what you would expect. Cheap sausages (which I don’t necessarily mind) fries and peas. The fries and the peas seemed perfectly fine. My daughter did enjoy the sausage, but it did seem like the sausage meat inside had disintegrated. When I tried to cut into it the meat fell out and I am uncertain why that would happen. Perhaps because they were cheap sausages but they may have been kept warm somewhere and that was the cause. In any case, my daughter did enjoy her meal. However, I am a little more particular about my food. The pork baguette was placed in front of me and at first, it looked as though I was given a tune baguette with apple sauce on it. On closer inspection, I could tell it was pork but nothing like what I was hoping for. I was looking forward to getting my teeth into some decent chunks of meat. Slices of pork would have been perfect, pulled pork just as good but I’m not even sure how they managed to get it that way. It didn’t taste of much either. If it was seasoned, it wasn’t seasoned well. 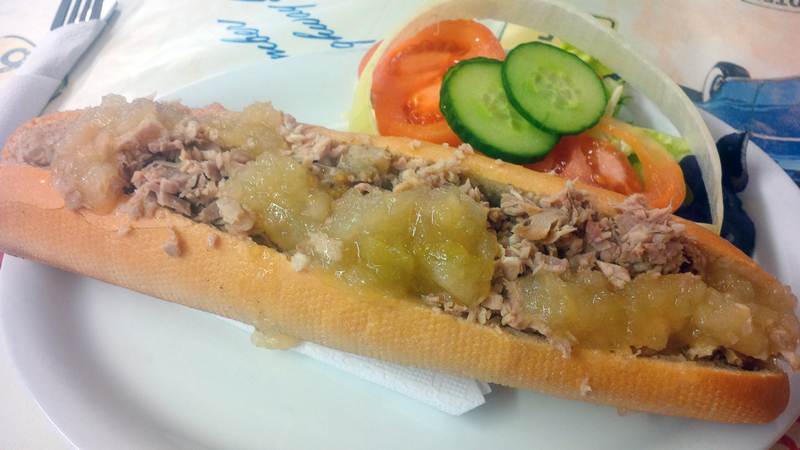 The overriding flavour in this baguette was stuffing and apple sauce. I also noticed that the meat was brought in from a room out the back in tubs and placed onto the grills at the front. I couldn’t say for certain whether or not it was just cooked in another room or whether or not it came from somewhere else entirely. It’s safe to say, I wasn’t happy with it but I wasn’t the only one. There were four members of staff. None of them seemed to have a particular role. All of them serving, cooking and taking payments. As a result, it was a little chaotic. At least one couple left the restaurant because they had waited so long for their food, handing the money for their coffees to a waitress on their way out. It was frustrating seeing that customers who had come in for takeaway orders were being served their food immediately. A couple of other tables were obviously a little annoyed that they had been waiting at their tables for some time after finishing their food only to find out that despite taking orders at the table, you had to pay at the counter. This meant waiting in the queue of people ordering takeaway just to leave. The fact you are supposed to pay at the counter is not made clear anywhere at all in the diner. One member of staff dropped a glass on the coffee machine, smashing into hundreds of tiny pieces. Although it was swept up off of the coffee machine and floor (using only a dustpan and brush), it remained on the filter coffee machine and nobody seemed to check the salad counter directly opposite and lower than the coffee machine. Another member of staff had strawberry sauce all over her own face trying to make an ice cream. I know mistakes are made but considering everything else it certainly didn’t help matters. All of this aside, their roast potatoes did look quite nice. Perhaps I should have had the roast dinner after all. To sum up, I hope I caught them on a bad day but I wouldn’t recommend eating at Retro Diner in Abergavenny. Previous PostPhotography and FoodNext PostMeat Free Week: Could You Give Up Meat For a Week? Thanks for the heads up. I may have gone in there and been as perplexed as you were. Not a mistake I will have to make.